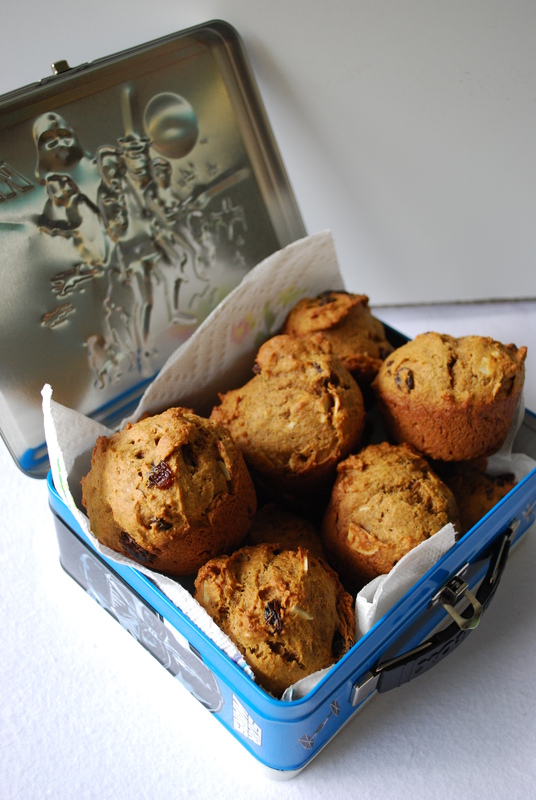 5-fruit* muffins for your Munchkin’s lunchbox. *or 4 fruits & a gourd, depending on how you choose to classify pumpkin. School’s started for most everyone by now, & I know lots of moms are looking for tasty but healthy options for their kids’ lunchboxes. These muffins fit the bill: they contain five different fruits (as long as you consider pumpkins fruits), as well as almonds & whole-wheat flour. They pack a quick & hearty nutritional punch so your kids can get back onto the playground. They’re so hearty that The Munchkin can only finish half of one, so you may want to consider packing just a half muffin, or else making them in a mini-muffin tin & adjusting the baking time. They’re also great for new moms because of their heartiness & ease of one-handed consumption. They were brought to me after The Mini-Munchkin made her appearance & I begged for the recipe, so that’s why you’ve got it here! The recipe says it makes a dozen muffins plus 2 loaves; when I made a half recipe, it yielded not quite 18 muffins. You can choose how & if you want to divvy up the batter. As an added bonus, if you make a half recipe, you’ll have plenty of pumpkin left over in a standard can to make these delicious pumpkin chocolate-chip squares. Just saying. Preheat oven to 350. Generously grease muffin tin &/or loaf pan(s). Combine bananas, pumpkin, eggs, & sugar in mixer bowl. Beat in applesauce. In a separate bowl, combine dry ingredients. Stir into banana mixture until just combined. Fold in dates, raisins, & almonds. Spoon 1/4 cup of batter into each muffin cup; pour remaining batter into loaf pans, if applicable. Bake muffins for 20 minutes or loaves for 60 minutes. Cool in pan 5 minutes, then cool completely on wire rack.